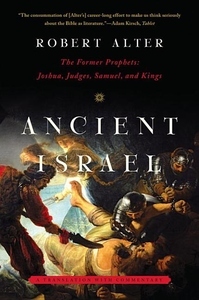 To read the books of the Former Prophets in this riveting Robert Alter translation is to discover an entertaining amalgam of hair-raising action and high literary achievement. Samson, the vigilante superhero of Judges, slaughters thousands of Philistines with the jawbone of a donkey. David, the Machiavellian prince of Samuel and Kings, is one of the great literary figures of antiquity. A ruthless monarch, David embodies a life in full dimension as it moves from brilliant youth through vigorous prime to failing old age. Samson and David play emblematic roles in the rise and fall of ancient Israel, a nation beset by internal divisions and external threats. A scattering of contentious desert tribes joined by faith in a special covenant with God, Israel emerges through the bloody massacres of Canaanite populations recounted in Joshua and the anarchic violence of Judges. The resourceful David consolidates national power, but it is power rooted in conspiracy, and David dies bitterly isolated in his court, surrounded by enemies. His successor, Solomon, maintains national unity through his legendary wisdom, wealth, and grand public vision, but after his death Israel succumbs to internal discord and foreign conquest. Near its end, the saga of ancient Israel returns to the supernatural. In Elijah's fiery ascent to heaven many would find the harbinger of a messiah coming to save his people in their time of need.